I just read something that sent chills down my spine. Due to our recent erratic weather causing a bloom of flowers across our nation, more butterfly species have migrated to Singapore. On top of our terrible weather now I have something else to fret about? While butterfly wings are indeed stunning (I love their wings actually, I love drawing butterfly motifs and adore wearing butterfly-shaped accessories), their insect bodies are just something I cannot bear to even look at. 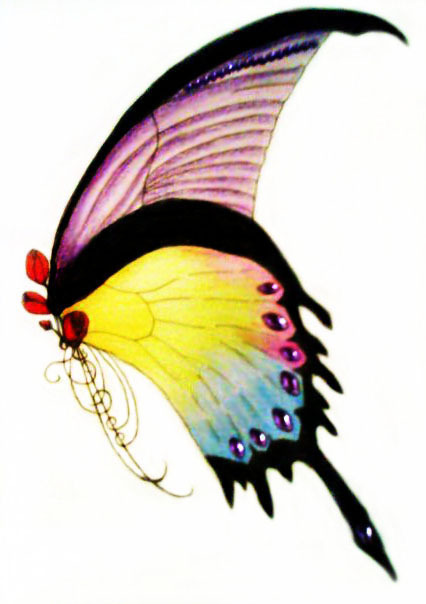 A really old drawing of a representation of butterfly. I replaced the freakish insect body with rose buds. Some might think that butterflies are a beauty of nature. But to me they are just another grotesque insect with deceptively beautiful wings that serve as a camouflage for their ugly alien insect bodies. Just perhaps a slightly less disgusting version of a moth. Moths are definitely worse than butterflies, yup, with their stout, hairy bodies and ugly dull wings. And they somehow tend to stalk me in the bathroom. Whenever I discover a moth in the bathroom it would be a not-so-fun chasing game whereby the moth would flutter towards me and I would try to twist and turn my body in the weirdest angle, spraying water across the bathroom walls and wetting my clothes and towel in the process. At times in a frail attempt to fight back and conquer the brown, hairy evil winged critter, I would aim the showerhead at it to no avail. Usually this battle ends with me in defeat as I rush out of the bathroom in seek of a saviour to remove the hairy bug out of my sight. While an influx of butterflies may not be as bad as moths, since they do not have the habit of being in an enclosed space like moths, butterflies still make my skin crawl when I am near them. When I was younger I loved to read books about animals, and attempted to read about insects as well. And I found that I simply could not bear to even touch the pages with the insect bodies magnified in their fantastically ugliness. Even though I had found Blue Morpho Butterfly’s iridescent blue wings absolutely breathtaking, I still could not get past their bug-like bodies. I can’t even begin to imagine how butterfly park and insect kingdom is like. It would be a creepy crawly nightmare to me. While some might fancy it as a scene straight out of fairytale to have a butterfly landing on their finger, I would pass out in sheer terror to have a butterfly land on any part of my body.